Hangry Hubby? This Savory Soup Will Warm His Heart! I love Sundays at home during the fall! We’re so busy over the summer that we rarely just sit and enjoy our home but come fall, it’s nesting time. One of my favorite things to do on Sunday is to put on a big pot of savory soup and let it simmer away while we watch the Browns game. After the game, it’s dinner time. Today’s recipe is probably our all-time favorite as far as my soup recipes go. I originally got it from the October, 1993 issue of Bon Appetit. Yes, I’ve been making it for 25 years and hope to be making it for 25 more. It’s just that good! Spicy! The way we like it! 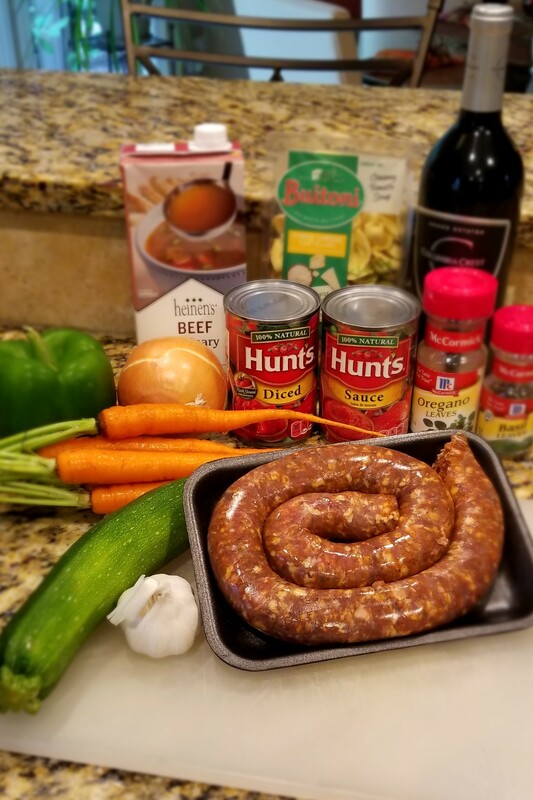 Use chorizo or hot Italian sausage. I Like Some Spice. Use a 50/50 blend of sweet and hot or chorizo. Makes 4-6 servings. Easily doubles. Saute sausage in heavy Dutch over over medium-high heat until cooked trough, crumbling with back of spoon, about 10 minutes. Using slotted spoon, transfer sausage to large bowl. Pour off all but 1 tablespoon drippings from Dutch over. Add onion and garlic to Dutch over and saute until translucent, about 5 minutes. NOTE: Chorizo is pretty lean and I rarely had any drippings so now I just cook the sausage, onion and garlic all at one time. Cooked sausage, onion, garlic mixture. Add tortellini to soup and cook until tender, about 8 minutes. NOTE: If there are just 2 or 3 of you and you are planning to serve this each night, only put in the amount of tortellini for one evening’s meal and add the rest the second night. Otherwise the tortellini will absorb too much of the soup broth. Season soup to taste with salt and pepper. Ladle soup into bowls. Sprinkle with Parmesan and serve. Pair with a salad and Italian cookies or gelato for dessert. I have this recipe and it’s always a hit! I used to make it for my church’s Soup Sunday and it was always the first to run out. That’s so funny! Our church had a “Souper Bowl Sunday” that I would take this too and same thing – big hit! This sounds so delicious! Perfect for the fall weather. Thanks for sharing! Thank you! One of those recipes we always look forward to! Hope you do and hope that it’s a hit! Thanks so much for stopping by – always appreciate the support of friends and readers!